One of the most important moments of the official visit paid by His Beatitude Sviatoslav to Poland became a meeting with His Eminency cardinal Kazimierz Nycz, Archbishop and Metropolitan of Warsaw, arranged on March 15, 2018 in The Kazimierz Palace. Cardinal Kazimierz told His Beatitude Sviatoslav about support he delivers our bishops in Poland to open new pastoral centers of spiritual growth for believers of Greek-Catholic Church, as mainly in Warsaw and on the territory of Warsaw’s Archdiocese the biggest amount of Ukrainian migrant workers is based. 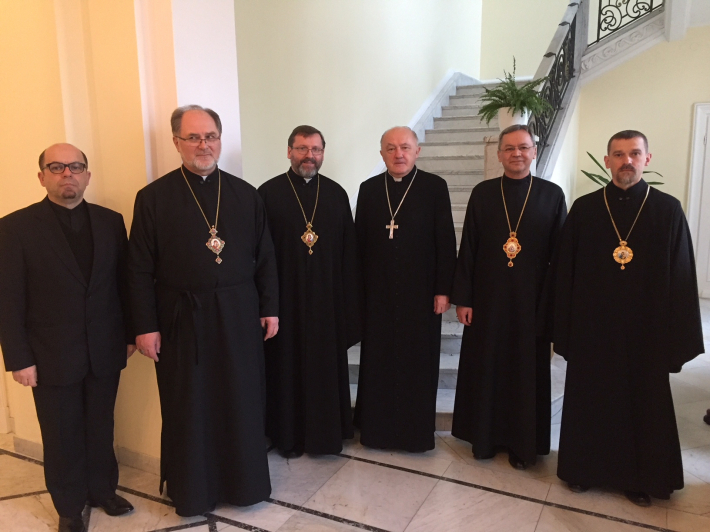 Archbishop of Warsaw assured Head of UGCC in opportunity for Ukrainian priests to serve for Greek Catholics in Roman Catholics cathedrals, where the majority of Ukrainian migrant workers are based and where there is an extreme need. His Beatitude Sviatoslav, thanking cardinal for his openness and help, mentioned that cooperation between Ukrainian and Polish episcopate will provide a mutual convergence for people of both countries and will help to make further important steps for Christian testimony in a modern world.